Ever wanted to advertise you business even after you have closed for the day? 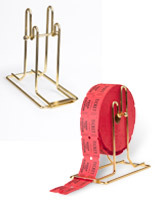 One of the best solutions for this is an outdoor business card holder. 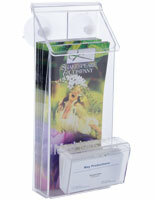 Our line of exterior contact information displays includes dispensers with lids. These lids, or flaps, keep rainwater and moisture from destroying the printed materials inside, so your cards will always be legible and look professional. 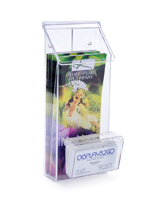 There are variety of different designs available for these outdoor calling card dispensers, including single and multi-pocket systems. 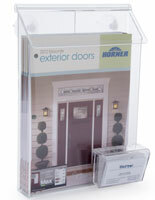 Some of the configurations even include secondary pockets that hold brochures, catalogs, or other 8.5" x 11" print-outs. 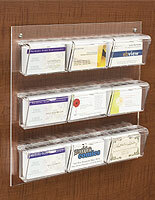 Customers can choose from standard wall mounting holders or window and glass mounting options. 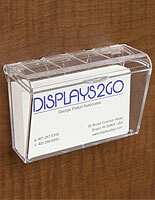 Window mount business card holders are ideal for attaching to a car, truck, or service van. 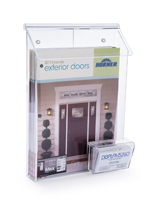 Several of these units include suction cups that stick to the window but others have foldover designs that fit neatly over the car window and secure upon rolling it up. Make every vehicle in your fleet a mobile advertisement or just bolster your business' presence in your community. 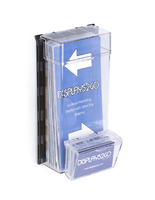 The promotional possibilities are endless with these business card holders for outdoor use!